The next International Euphorbia Convention has now been finalised for 18th and 19th of May 2019. The location is at the Botanic Garden Meise. An application form in Microsoft Excel format is available here. Invitation to the 14th Annual General Meeting of the I. E. S.
Dear Member of the International Euphorbia Society. Herewith we like to invite you to attend the 14th Annual General Meeting (AGM) of the I. E. S. The meeting will take place on Saturday September 8th, 2018 at 14:00h. local time at the Hotel Corsendonk Duinse Polders, A. Ruzettelaan 195, 8370 Blankenberge, Belgium. Host for this event is the 53th European Cactus & Succulent Congress, organized by the Europese Landen Konferentie (ELK), for September, 7-8-9, 2018 at the resort mentioned above. Besides attending the I. E. S. Annual General Meeting on Saturday September 8th, please, enjoy a free visit to this 3-day renowned fair and expo of cacti and other succulent plants, performed by over 140 European suppliers, amateur and professional. The fair is much recommended if you are searching for traditional collector's species, rarities, recently discovered and/or newly described succulent plants. For programme and 6 lectures, please, consult the website www.elkcactus.eu . You are welcome! Committee of the International Euphorbia Society I. E. S.
Agenda of the 13th Annual General Meeting of the I. E. S.
Opening by the Chairman, Rikus van Veldhuisen. Approval of the Minutes of the 13th AGM of September 9th, 2017. Brief reports by the Chairman (Rikus van Veldhuisen), the Vice-Chairman (Piet Huesman), the Secretary (Pjotr Lawant), the Treasurer & Membership Administrator (Bob Potter), the Editor (Volker Buddensiek), the Publicity Officer (Thomas Cammaerts), the General Support Officer (Christian Blenn) and the Curator of the Reference Collection (Jaap Keijzer). Members' comments and/or questions about the foregoing reports. Report about the maintenance of the I. E. S. website by Peter Arthurs. Comments or questions received from members in the course of the past year. Suggestions from the members present how to increase the number of subscribers. Presentation of the preparations made for and the programme of the Second International Euphorbia Convention to be held on May 18th and 19th, 2019, at the Botanic Garden Meise at Meise, Belgium. The Convention includes a number of lectures by renowned speakers, plant sales and the opportunity to visit to the succulent collection of the Botanic Garden Meise. For more information, please contact Thomas Cammaerts at thomascammaerts@hotmail.be or Rikus van Veldhuisen at rikus@u4ba.nl . Summary and final conclusion by the Chairman. Closure of the 14th AGM of the I. E. S.
For questions or comments, please, contact Rikus van Veldhuisen, Chairman I. E. S. and Pjotr Lawant, Secr. I. E. S.
A copy of the invitation is available here. The Minutes of the AGM are available for download here. You can purchase this book at a price of £20.00 plus postage (UK: £3.00; Europe: £7.00; rest of the world: £12.00) on the society's website (link) or by ordering it from our Treasurer and Membership Administrator Bob Potter by e-mail (bbpotter@woking.plus.com). Members attending the Annual Genaral Meeting of the I.E.S. on September, 9th, at the holiday resort 'Corsendonk Duinse Polders', Ruzettelaan 195, in Blankenberge, Belgium, can purchase the book at a price of £20.00 resp. €22.00 without extra cost for postage. Invitation to the 13th Annual General Meeting of the I. E. S.
Dear Member of the International Euphorbia Society Herewith we like to invite you to attend the 13th Annual General Meeting (AGM) of the I. E. S. The meeting will take place on Saturday September 9th, 2017 at 2 p. m. at the holiday resort 'Corsendonk Duinse Polders', Ruzettelaan 195 in Blankenberge, 8370, Belgium. Host for this event is the European Countries Conference, organized by the Europese Landen Konferentie (ELK), planned for the period September, 8-9-10, 2017 at the holiday resort named above. Besides attending the I. E. S. Annual General Meeting on Saturday September 9th, enjoy a free visit to this 3-day renowned fair and expo of succulent plants, cacti and other succulents, performed by over 130 European suppliers, amateur and professional. The fair is much recommended if you are searching for traditional collector's plant species, rarities, recently discovered and/or newly described plants. For programme and details, please, consult the website www.elkcactus.eu. And don't forget to note the lecture given by Bob Potter on Saturday September 9th at 10:30 a. m. local time, entitled A Euphorbia Odyssey. You are welcome! Approval of the Minutes of the 12th AGM of September 10th, 2016. Brief reports by the Chairman (Rikus van Veldhuisen), the Secretary (Pjotr Lawant), the Treasurer & Membership Administrator (Bob Potter), the Editor (Volker Buddensiek), the Publicity Officer (Thomas Cammaerts), the General Support Officer (Christian Blenn) and the Curator of the Reference Collection (Jaap Keijzer). Management: There is still a vacancy for the executive position of the Hon. Vice-Chairman (cf. Constitution, Art. 10d) and of the Hon. Website Officer (cf. Constitution, Art. 10j). Comments or questions received from members in the course of this year. Suggestions how to increase the number of subscribers. Presentation of the book Jatropha, by Albert & Daphne Pritchard, edited by Pjotr Lawant, based on a manuscript from the estate of the late Albert Pritchard, presenting 71 selected, more or less succulent Jatropha species, richly illustrated by photographs and drawings. Closure of the 13th AGM of the I. E. S.
You can purchase this book at a price of £20.00 plus postage (UK: £3.00; Europe: £7.00; rest of the world: £12.00) on the society's website or by ordering it from our Treasurer and Membership Administrator Bob Potter by e-mail (bbpotter@woking.plus.com). The index of species covered and of authors contributing to Euphorbia World has been updated and now covers all issues from Vol. 1(1) to Vol. 13(1). You can download the index as a pdf file here. A compilation of all Tables of Content is ready to download here. If you are interested in purchasing single issues of Euphorbia World in order to obtain single articles or information on certain species you can order back issues here. Please note that you cannot order any backissue of the most recent 3 Volumes (Vols 11 to 13) as the society depends on membership fees to cover costs of printing and posting the journal. > Sébastien Houyelle and Christophe Quénel, well-known explorers of the Madagascan flora, telling readers about the rediscovery of Euphorbia boinensis, a species that has been thought of as extinct, since it has never been found for almost 100 years. They show us pictures of the plant in habitat that most likely nobody has seen before. > Rikus van Veldhuisen and Pjotr Lawant introduce readers to Euphorbia subgenus Euphorbia section Rubellae - a small group of geophytic euphorbias from Tropical East Africa, including such beauties as Euphorbia brunellii, E. rubella, E. cryptocaulis and E. charleswilsoniana. > Finally, Detlef H. Schnabel introduces another hardy Euphorbia for northern gardens, i.e. Euphorbia amygdaloides and its hybrids and varieties. Do not miss the latest issue of Euphorbia World as it will only be distributed to subscribers who have already paid their subscription fee for 2017. In case you have forgotten about it, you can renew your subscription here! The index of species covered and of authors contributing to Euphorbia World has been updated and now covers all issues from Vol. 1(1) to Vol. 12(3). You can download the index as a pdf file here. Issue 12(3) has been printed. The last issue of 2016 is on its way from the printers. You may look forward to another exciting issue of Euphorbia World that covers a text on Euphorbia in Zimbabwe written by our President Susan Carter including (among others) gems like Euphorbia decidua and E. wildii as well as the rarely shown E. acervata and E. citrina. Detlef H. Schnabel starts his series on hardy euphorbias for northern gardens with portraits of E. characias, its subspecies and varieties. An Euphorbia that flowers like an orchid? Yes, there is one, and Rikus van Veldhuisen introduces it in beautiful pictures. Pjotr Lawant tells about two newly described Euphorbia species: E. gokakensis (from India, closely related to E. caducifolia) and E. seshachalamensis (from India as well, but a tuberous species allied to E. meenae and E. fusiformis). He also summarizes a paper on the dispersal of dendroid Euphorbia species on the Canary Islands. Massimo Afferni also looks at a very special Euphorbia species from the Mediterranean: Euphorbia spinosa - that isn't spiny at all! Don't miss out the latest issue. And don't forget to renew your subscription to receive the next upcoming issue of Euphorbia World! The index of species covered and of authors contributing to Euphorbia World has been updated and now covers all issues from Vol. 1(1) to Vol. 12(2). You can download the index as a pdf file here. If you are interested in purchasing single issues of Euphorbia World in order to obtain single articles or information on certain species you can oder back issues here. Please note that you cannot order any backissue of the most recent 3 Volumes as the society depends on membership fees to cover costs of printing and posting the journal. You can find the list of pictures needed here for download. The Annual General Meeting of the I.E.S. will take place on Saturday September 10th, 2016 at 14:00 local time at the holiday resort ‘Corsendonk Duinse Polders’, Ruzettelaan 195, Blankenberge, Belgium. You can find the invitation and the minutes of the AGM for download here. The index of species covered and of authors contributing to Euphorbia World has been updated and now covers all issues from Vol. 1(1) to Vol. 12(1). You can download the index as a pdf file here. Issue 1 has been sent to members. We are glad to tell you that we managed to add a few more pages than usual. If you haven't received your personal copy please contact the Membership Administrator. For more than a century secretive Euphorbia caput-aureum has been the "holy grale" for botanists exploring the Euphorbia flora of Madagascar. Nothing else was known of this mysterious species than a description and a locality that could not be traced anymore. That is, until Christophe Quénel set out to search for it - and found a most beautiful species with cyathia arranged to form a "golden head". In Euphorbia World he reports on his quest and shows us the first photographs of this species that had been lost for so long. During the Euphorbia World Convention in 2015, I.E.S. President Susan Carter has given an inspiring lecture on Euphorbia from Somalia illustrating her wealth of experience with East African Euphorbia species. For all of you who could not attend the Convention Susan has written a comprehensive text illustrated with beautiful pictues showing our favourite subject: succulent Euphorbia. Not so long ago Rikus van Veldhuisen has been on botanical excursion in Aethiopia with some fellow plant ethusiasts. In this issue he summarizes his numerous encounteres with plants that might be Euphorbia borenensis (or something new). Very worth studying! 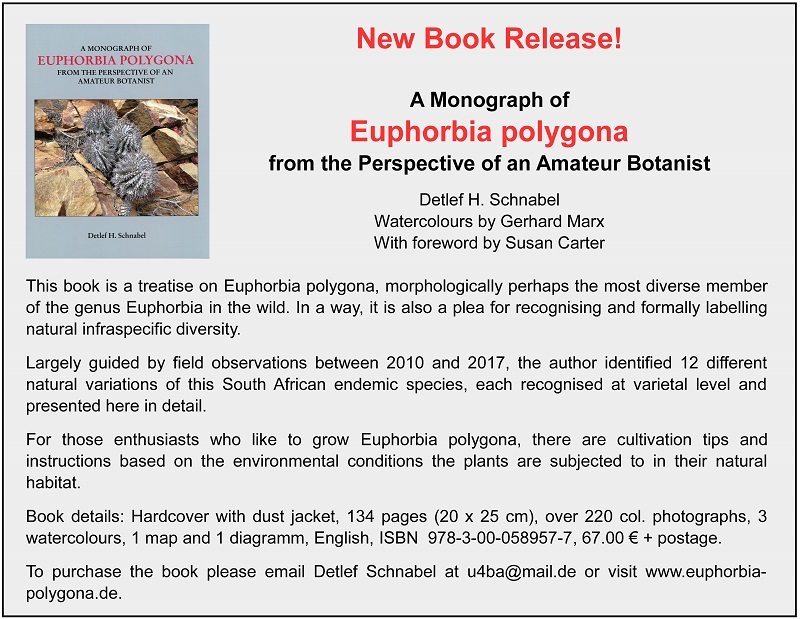 In Detlef Schnabel's series of papers on Euphorbia polygona and its varieties, one of the main difficulties was that there was no population of Euphorbia polygona var. horrida (once Euphorbia horrida) known to science anymore - despite that fact that many collections hold plants labelled that way (whatever they really are). Now var. horrida has been found again in habitat - and Detlef shows us the TRUE Euphorbia polygona var. horrida! In issue 11(3) of Euphorbia World we started a series on Brazilian Euphobias. Now Otávio Marques, Inês Cordeiro & Ricarda Riina report on Euphorbia section Crossadenia - a group that includes Euphorbia appariciana, E. crossadenia, E. flaviana, E. goyazensis., E. gymnoclada, E. lycioides, E. sarcodes, E. sessilifolia, E. teres and the recently described E. riinae. Don't miss out this new issue of Euphorbia World - and besides: It is the first one with increased number of pages! If you haven't yet joined the I.E.S. do right now to save you a copy of this issue! Issue 3 has been sent to members. If you haven't received your personal copy please contact the Membership Administrator. Ricarda Riina, Otávio Marques & Fernanda Hurbath start a series on Euphorbia from Brazil. In part 1 these autors give an overview on the section Brasilienses, best known for its succulent species Euphorbia phosphorea, E. attastoma, E. holochlorina and E. sipolisii - including a table of morphological features helping to correctly identify these species. Euphorbia World editor Volker Buddensiek and Alfred Razafindratsira, well-known explorer of the Madagascan flora, describe a new succulent species from the red tsingys of Madagascar: Euphorbia ramena. I my opinion one of the most beautiful euphorbias ever discovered on this treasure island. Speaking of Madagascar: Bob Potter will contribute beautiful pictures of Madagascan Euphorbia taken in habitat. Gerhard Marx once again shares his passion for medusa's head Euphorbia, sorting out the many errors around Euphorbia crassipes including confusions occuring around E. fusca and E. decepta. Very worth reading carefully to increase your knowledge of these species. Finally Massimo Afferni once again invites readers to follow his excursions to the Canary Islands in search of rare shrubby Euphorbias. The Annual General Meeting of the I.E.S. will take place on Saturday September 12th, 2015 at 14.00h local time at the Holiday Centre Duinse Polders, Ruzettelaan 195 in Blankenberge, Belgium. Issue 2 of 2015 is out and on its way to members. Apart of some impressions of the Euphorbia Convention in Meise (see below) it has two major publications: Gerhard Marx and Rikus van Veldhuisen have finally solved the question of what is the medusoid Euphorbia brevirama, coming up with some surprising insights and adding two new varieties to this mysterious species. The other large paper is part two of Wolfgang Ewest's review of geophytic Euphorbia from Chile, including Euphorbia thinophila and Euphorbia copiapina. Again he adds a new species to this group of interesting plants: Euphorbia cyanofolia Ewest. Last but not least our Chairman shares some of his pictures of his latest travel to Ethiopia. Very much worth seeing! Back issues of volumes 10 and 11 of the Euphorbia World are only available by subscription. So if you do not want to miss these papers you may subscribe here. The Euphorbia Convention at the Botanic Garden in Meise (Belgium, May 16 & 17) was definitely was a highlight for those attending the Convention. Not only because of a number of most interesting lectures given by the most renowend Euphorbia specialists but also because of a unique chance to exchange knowledge, purchase new plants and to visit the superb Euphorbia collection of the Botanic Garden in Meise. You can read a short summary and see some pictures of the event here. For further pictures please have a look at our facebook pages. The official programme of the Euphorbia Convention taking place at the Botanic Garden in Meise (Belgium) from May 16th to 17th has been finalized and is ready for download! The number of participants is limited - but there are still a few tickets left. Book fast - the Euphorbia Convention celebrating the 10th anniversary of the International Euphorbia Society is very much worth visiting: from a once-in-a-lifetime line-up of lecturers such as Susan Carter or Norbert Rebman to the opportunity to visit the phantastic Euphorbia collection of the Botanic Garden Meise that usually is not open to the public. Issue 1 of 2015 is out and delivered to members. It has two very fine papers from our Chairman Rikus van Veldhuisen: one on Euphorbia globosa and related species , and the second one the last part of his series on the cultivation and propagation of Euphorbias. This time he shares his experiences with "difficult species" and intensive care! Al Laius has travelled Zimbabwe and takes us on his trip with some pictures in our "In habitat" section. Finally Wolfgang Ewest gives an overview on geophytic Euphorbia from Chile including the description of two new species: Euphorbia melicae Ewest and Euphorbia crypta Ewest. In part one of his two-part-paper he also portrays the little-known Euphorbia porphyrantha. According to the I.E.S. policy single issues of volumes 10 and 11 are only available by subscription. So if you do not want to miss these papers you may subscribe here. The Euphorbia World Index of Authors and Taxa Covered has been updated. The new version includes the complete 10 volumes published so far. It can be downloaded here. A compilation of all Tables of Content from Vol. 1, no. 1 to Vol. 10, no. 3 is available for download here. Euphorbia World issue 3 of 2014 is out to our members. It has a marvellous paper on the rediscovery of Euphorbia biaculeata - that hadn't been found again since its first discovery a century ago! Great pictures of a species, hardly anyone has seen before! Furthermore Philippe Fenin closes his report on his Malagasy journey (part 3). We continue our "series" of new species with the description of Euphorbia dilloniana, a new geophytic species from Chile closely related to Euphorbia thinophila. Chairman Rikus van Veldhuisen adds a very interesting article on sowing euphorbias, and Detlef H. Schnabel put things clear with an amendment of the typification of Euphorbia polygona var. horrida. For the table of content see "About our Journal". Last, but not least: Don't forget to register for The International Euphorbia Convention 2015! You can download the programme of the Convention here, the Registration Form is available for download here. To celebrate the 10th anniversary of the International Euphorbia Society, the I.E.S. in cooperation with the Botanic Garden Meise (Belgium) will organize an International Euphorbia Convention on May, 16 & 17, 2015, at the Botanic Garden Meise/Bruxelles. Lectures will be given by well-known Euphorbia specialists like Susan Carter, Petr Pavelka, Bob Potter, Norbert Rebmann, Ricarda Riina, and Rikus van Veldhuisen. In addition, there will be guided tours; the opportunity to visit the Euphorbia Reference Collection of the Botanic Garden Meise (The curator of the collection will be present), and - last but not least - both a plant show and a plant sale. The number of participants is limited, so registration in advance is necessary in order to secure access to the event. There is a special discount on entrance fee for members of the I.E.S. as well as an early booking rate that is limited to January 1, 2015. You can download the Programme of The International Euphorbia Convention here, the Registration Form is available for download here. On Saturday, the 13th of September, the Annual General Meeting (AGM) of the I.E.S. was held at the International Plant Fair (ELK) at Blankenberge. The meeting was opened by our Chairman Rikus van Veldhuisen. All Committee members needed to introduce themselves because of the great number of members that was present that day. This was the best meeting yet, there were a lot of familiar faces, but as important, a lot of new faces as well. The interest in our Society by the members is growing every year. After the minutes of last year were approved, the brief reports of the Committee Officers could start. Membership Secretary Pjort Lawant got some good news that our membership account was developing well. We even have a National Representative in Madagascar now. After this news it was no surprise that Bob Potter, our Treasurer , could state that the I.E.S. is doing well financially. If membership fees are paid in time there will be no problems in near future. Volker Buddensiek, editor of the I.E.S., reported that we have a limited amount of articles for future issues of ‘Euphorbia World’. Most articles keep coming from members who made trips to Africa, Oman, Madagascar, etc. Since last year’s meeting we have known that members ask for more practical articles on growing and keeping euphorbias. We started to respond to it by a series of articles by our Chairman Rikus van Veldhuisen. Further papers from members are welcome! Volker also manages the website for the I.E.S. and after many years he would like to pass on the maintenance of the website to someone else. He will keep everything in good order until a suited replacement is found. It is needless to say that managing the EW issues and the website is a lot of work and Volker has always done a more than good job. The Curator of our Reference Collection, Jaap Keijzer, has been busy like every year with propagating euphorbias so they become accessible to our members. One of the biggest projects not just for this year is organizing the International Euphoria Convention at the Botanic Garden Meise in Belgium. Our Publicity Officer Thomas Cammaerts, together with Rikus van Veldhuisen and Jaap Keijzer, had a meeting with the Director of the BG Meise and arrangements were made to organize a 2-day event with international Guest Speakers, guided tours, a plant sale, a plant show and a view in the Euphorbia Reference Collection of the BG Meise. We now have come up with a rather impressive list of guest speakers, namely: Susan Carter, Norbert Rebmann, Ricarda Riina, Petr Pavelka, Bob Potter and Rikus van Veldhuisen. This Convention will be THE event for every Euphorbia enthusiast. During this AGM Meeting the last problems concerning the Convention were discussed and now everything can be posted online and on the website. You can now find the registration form and all other information on our website. Another channel to make good publicity is our Facebook page. We had a very positive amount of new visitors to the page. The most popular interaction is of visitors asking to identify their plants. New pictures are posted regularly and the quality of the pictures is very much appreciated by our I.E.S. members. After the brief reports it was time for members’ questions. After reading out loud an e-mail of one of our members who had come up with a lot of good suggestions, we needed to discuss these. One of his points was reserving some space in the EW for members to interact with each other and respond to the articles in EW. To us it was a good suggestion, but we only publish 3 issues a year so the interaction in that column would not be very user friendly and should better take place at our Facebook page. Another point was not to make the articles too scientifical. The most important suggestion was to put our EW issues online to decrease the costs of printing and to allow us to lower the membership fee. We will discuss this matter in future intern meetings. Increasing the number of subscribers is also a regular point of discussion. The suggestion to put EW online and to charge lower membership rates will be something to study in future. Some members join through Facebook and other mostly through word-of-mouth recommendation. Other activities are somewhat on hold because of the organization of the Convention. If this Convention becomes a success, we might be able to pick up our plans to publish a book on Jatrophas, a last work of Albert Pritchard. With this our Chairman offered to talk about any other subjects. Former Chairman Alan Butler wanted to compliment Rikus for a job well done and added that our Committee is doing a great job. Thanks for those kind words Alan. Our Chairman then closed the meeting. We all hope to meet a lot of Euphorbia enthusiasts at the Convention next year! PS: The Minutes of the AGM 2014 can be downloaded here! You can download details on the AGM and the agenda of the meeting here. Our new issue of Euphorbia World has been sent to members, including new desribed species Euphorbia audissoui Marx and Euphoribia leachii Lawant & van Veldhuisen as well as very fine habitat pictures of Euphorbia in Madagascar and South Africa. Chairman Rikus van Veldhuisen adds a new chapter of his series on cultivation and propagation of Euphorbia. See table of content here. * Euphorbia tridentata (Lam.) var. ornithopus (Jacq.) van Veldhuisen & Lawant comb. & stat. nov.
* and on some dubious interpretations of Euphorbia patula Mill. These 3 articles are a split and condensed version of a long monograph. A compilation of all Tables of Content from Vol. 1, no. 1 to Vol. 10, no. 1 is available for download here. Euphorbia World Vol. 10(1) has been published! On March 22 Rikus van Veldhuisen, I.E.S. 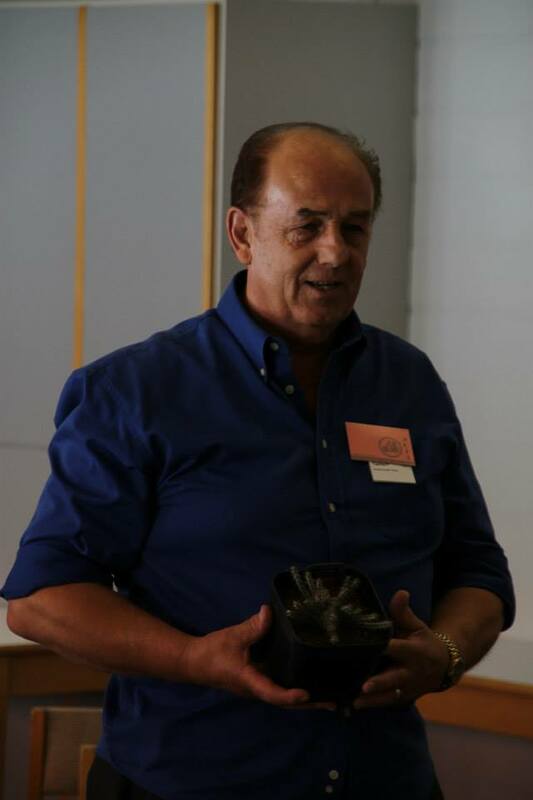 Chairman and well-known author of numerous articles about Euphorbi,a will give two lecturs at the International Convention of the British Cactus & Succulent Society (BCSS). The titles of his lectures are "On the Track of Succulents in Ethiopia" and "Medusoid Euphorbias". Both lectures are highly recommeded for Euphorbia enthusiasts. Address of the venue is Giffard Park Primary School, Broadway Avenue, Giffard Park, Milton Keynes, UK. For further information please check the event calendar of the BCSS. Euphorbia World Vol. 9(3) has been published! For the table of content see here. The 2013 Annual General Meeting took place on 7 September 2013. The minutes of our 2013 Annual General Meeting are online. Tony Harcourt is the winner of the first I.E.S. Plant Show. His beautiful Euphorbia horwoodii got the highest number of points of the plants presented. A close-up of the Euphorbia horwoodii specimen with its perfectly developed 5 series of side branches. All of our officials made a little report of their tasks. We also welcome a new official, Christian Blenn. As a new official he will not take over one of the tasks immediately but will help where he can. It is truly appreciated as our website-officer, Walter Minuth, made the hard decision to stop with his activities for the society because of health problems. We thank Walter for all of the work done for the society and wish him all the best. We asked the members present at the meeting, if the magazine is still good or what they would like to change. Conclusion is that the articles are good as they are, scientific but not too scientific. There was just one thing where all of the members and officials agreed on and that was to make more articles including cultivation of the plants. This is difficult because we are international and some members don't even live in the same hemisphere. We will work on this topic. We also looked into the future to see what we could do to get new members. This is important to maintain our fantastic society. One of our ideas is to organize an international symposium for all Euphorbia-enthousiasts at the National Botanic Garden of Belgium. We will now see if the response for this idea is positive and they make more concrete plans. An other subject was to see if it is possible to release a book on Jatropha's. We will see what the future brings. The meeting finished with the first I.E.S. plant show, a contest for the most beautiful Euphorbia. 5 plants where introduced and all of them where treasures. As Publicity Officer I can say that this meeting was a success and we where very happy to see that there where even more member's than last year and they participated positive in the meeting. Thank you for your presence and hope to see even more members next year. The 2013 Annual General Meeting will take place on 7 September 2013. We would like every member to take part and herewith ask you to have a look at our Invitation and Agenda. There are two very interesting articles of our IES-member Rene Samek online. Please have a look here. The 2012 Annual General Meeting took place on 8 September 2012. The minutes of our 2012 Annual General Meeting are online. The 2012 Annual General Meeting will take place on 8 September 2012. We would like every member to take part and herewith ask you to have a look at our Invitation and Agenda. The minutes of our 2011 Annual General Meeting are online. The first issue of Euphorbia World volume 8 is currently being printed. Members may look forward to reading an article of our President Susan Carter on non-spiny succulent euphorbias from eastern tropical Africa. D Russel Wagner provides a text named The "Doctrine of Signatures": Euphorbia clavarioides in Johannesburg's Muti Market". Rikus van Veldhuisen introduces Euphorbia schoenlandii, while Jeffery J. Morawetz takes us to a journey to the Euphorbias of Oman. 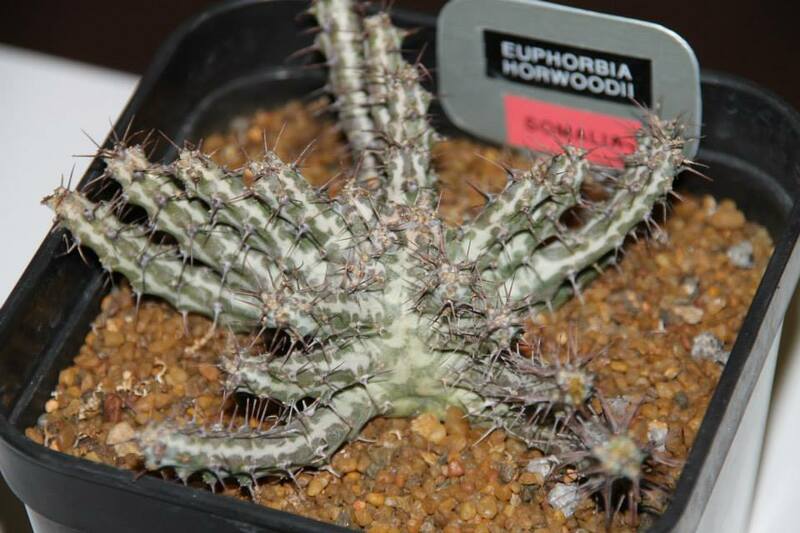 Detlef H. Schnabel describes a new variety of Euphorbia polygona, i.e. Euphorbia polygona var. exilis and finally there will be a paper from Hans Frohning on digital stereo macrophotography and photo stacking as modern tools for botanical studies. You will see breath-taking pictures in a quality you have never even dreamt of before. The IES now has its own website at the social network Facebook. You will find it under the name 'Euphorbia World'. If you do not have a Facebook page, you will have to make one online. It is very easy and completely free. You can also protect your page against outsiders if you want. This page is for collectors, nurseries, scientists, botanical gardens and everyone else who want's to share pictures or experiences with Euphorbiaceae. Of course, questions about cacti and other succulents can be answered but the main goal is to interact about Euphorbiaceae. Thomas Commaerts has volunteered to act as Publicity Officer of the IES. Thomas is a gardener by heart working at the National Botanical Garden of Belgium. For contact details see our "Officials" web page. At the annual membership meeting that took place again at the ELK in Blankenberge, Belgium, the commitee suggested to have a new constitution for the IES. The suggestion was accepted by the members present. The new constitution is online on this website. During the membership meeting Walter Minuth was elected new Vice Chairman and Web Officer and Rikus van Veldhuisen was elected new Chairman of the society.